When choosing where to service your vehicle, Bruce Titus Olympia Chrysler Jeep knows that you want the best care for your car. Each technician, at our state of the art service facility, is trained and certified to work on your Chrysler or Jeep vehicle. Olympia Chrysler Jeep is proud to offer a number of services for your new or later model vehicle. Oil changes, new tires and break services are among the most common services we provide for Olympia, Lacey, Shelton, and Tacoma. We ensure that our technicians highly trained and qualified in completing all your service needs. We have made it easy to schedule oil changes, tire rotations, brake replacements or any other type of auto service online! Frequent oil changes extend the life of any vehicle. Along with your oil change we will provide to you a 24 point inspection to inform you of all the vitals of your vehicle. If your vehicle is burning or leaking oil our professional service team will diagnose the problem and discuss solutions with you. Below are the basic services we provide with our oil change package in Olympia. What are the warning signs that my brakes need service? Your vehicle pulls to one side during braking. Brake pedal pulsates when you apply the brakes. Stepping on the brake pedal or normal driving causes a noise. The master cylinder is repeatedly low on brake fluid. If you’re noticing any of these warning signs, it’s time to have your Olympia area dealer’s service professionals inspect and diagnose your braking system. Why choose your Olympia Chrysler Jeep for brake service? 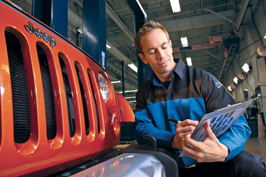 The work we do is performed by skilled, factory-trained technicians who work on Chrysler and Jeep vehicles everyday. We are Chrysler and Jeep experts, so there’s no learning curve. We have dedicated equipment for servicing your brakes, which ensures that the job is done right the first time. When purchasing Tires from Olympia Chrysler Jeep you can count on us to help preserve the longevity of your tires. Below we have listed just some of our tire services. We can help recommend which tires would work best for your vehicle and lifestyle. Your car wouldn’t go far without tires, we can help you make sure you get high quality long lasting tires to support your car.